5x HOT FIREPol® EvaGreen® HRM Mix is an optimised ready-to-use solution for High Resolution Melt (HRM) Analysis, incorporating EvaGreen® dye. 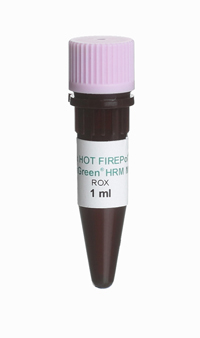 It comprises all the components necessary to perform qPCR and HRM Analysis: HOT FIREPol® DNA Polymerase, ultrapure dNTPs, MgCl2, EvaGreen® dye and ROX dye according to system requirements. The user simply needs to add water, template and primers. 08-33-00001 1 ml 5x PDF PDF PDF 35 EUR Login to buy! 08-33-00008 8 ml 5x PDF PDF PDF 264 EUR Login to buy! 08-33-00020 20 ml 5x PDF PDF PDF 600 EUR Login to buy! EvaGreen® is a DNA-binding dye with many features that make it a superior for HRM. Apart from having similar spectra, EvaGreen® has three important features that set it apart from SYBR® Green I: EvaGreen® has much less PCR inhibition, is extremely stable dye and has been shown to be nonmutagenic and noncytotoxic. EvaGreen® is compatible with all common real-time PCR cyclers – simply select the standard settings for SYBR® Green or FAM! Shipping and temporary storage for up to 1 month at room temperature has no detrimental effects on the quality of HOT FIREPol® EvaGreen® HRM Mix.